Fig.1. 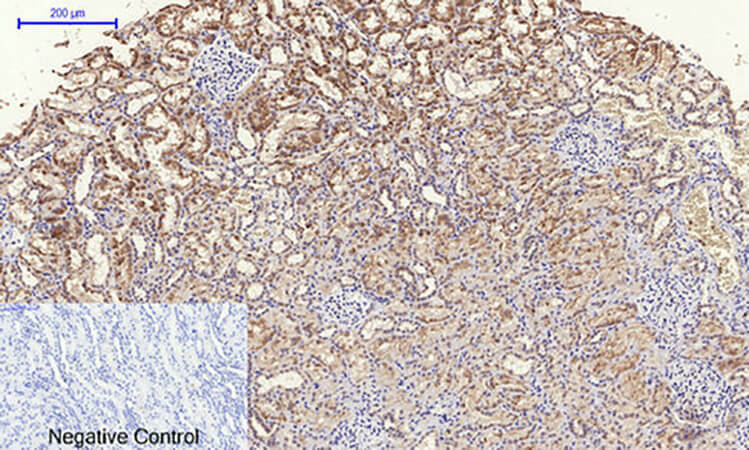 Immunohistochemical analysis of paraffin-embedded human kidney tissue. 1, TERT Polyclonal Antibody was diluted at 1:200 (4°C, overnight). 2, Sodium citrate pH 6.0 was used for antibody retrieval (>98°C, 20min). 3, secondary antibody was diluted at 1:200 (room temperature, 30min). Negative control was used by secondary antibody only. Fig.2. 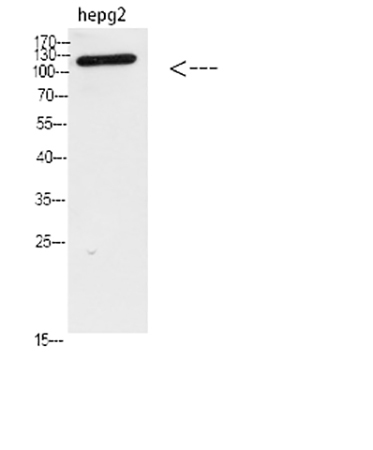 Western blot analysis of hepg2 Cell Lysate, antibody was diluted at 1:1000. secondary antibody was diluted at 1:20000. Telomerase is a ribonucleoprotein polymerase that maintains telomere ends by addition of the telomere repeat TTAGGG. The enzyme consists of a protein component with reverse transcriptase activity, encoded by TERT (telomerase reverse transcriptase), and an RNA component which serves as a template for the telomere repeat. Telomerase expression plays a role in cellular senescence, as it is normally repressed in postnatal somatic cells resulting in progressive shortening of telomeres. Deregulation of telomerase expression in somatic cells may be involved in oncogenesis. Studies in mouse suggest that telomerase also participates in chromosomal repair, since de novo synthesis of telomere repeats may occur at double-stranded breaks. Alternatively spliced variants encoding different isoforms of telomerase reverse transcriptase have been identified; the full-length sequence of some variants has not been determined. Alternative splicing at this locus is thought to be one mechanism of regulation of telomerase activity. The antibody detects endogenous TERT.